Inspector Wong arrests a seemingly disturbed man who has confessed to a brutal murder reminiscent of a children’s fable. After the supposed victim turns up alive and unharmed, the perpetrator is dismissed as a crank and let free. Days later, the victim turns up dead with his stomach cut open and stuffed with rocks. Wong realises he has let a dangerous killer go free and becomes obsessed with tracking him down whilst covering up his mistake. While Wong’s family life is neglected, more and more grizzly and bloody murders are committed laying reference to Cinderella, The Red Shoes and Hansel & Gretel. The latest (released) film directed by Danny Pang, who together with his colourfully named brother Oxide created the acclaimed Bangkok Dangerous and the international horror hit The Eye, both of which were remade in Hollywood, the first by the Pang brothers themselves. It's been a while since either of the brothers had a success of real note, and opinion is split on whether Fairy Tale Killer [Zui hung] is a partial return to form or a continuation fo a slow downward slide. BeyongHollywood.com were cautiously optimistic, highlighting a few damaging flaws but suggesting that "it remains an entertaining thriller, and both an above average piece of Hong Kong genre cinema and one of Danny Pang’s more accomplished recent films," while Asian Movie Web was a tad more damning, claiming that "Danny Pang may prove his technical expertise with his visuals and the dark coloring as well as some interesting camera angles, but the story he tells is tediously written and half-baked." Hmm. 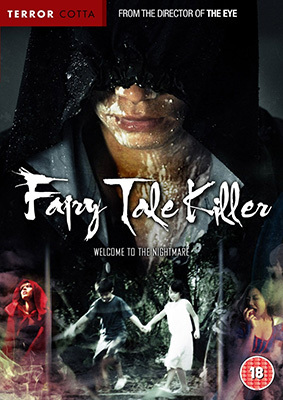 Either way, Fairy Tale Killer will be released on UK DVD on 7th October 2013 by Terracotta Distribution under the Terror Cotta label at the RRP of £14.99.